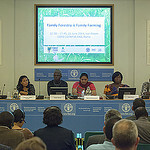 This was a conclusion of an in-session seminar titled “Family forestry is family farming”, held today during COFO 22 at FAO headquarters. 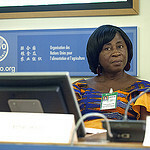 Seminar participants heard from diverse voices, including leaders from: a village-level organization in Myanmar; a federation in Nepal representing more than 11 million people; the National Farmers’ Platform of the Gambia, representing more than 200 000 farmers; a women’s producer group in Guatemala; the Farmers Union Network in Liberia, representing more than 35 000 forest farmers; and a national forest producer organization in Mexico, representing 670 000 producers. In each case, considerable success had been achieved through the organization of local forest farmers into producer groups and their subsequent increased role in national policy development and implementation. Government officials and forest farmer representatives, from countries as diverse as Guatemala, Kenya, Myanmar and Sweden, gave joint presentations on the many win–win outcomes that can be achieved when governments and smallholder forest producer groups work cooperatively towards common goals and build relationships based on mutual respect. The leadership role of women was emphasized and the need to create opportunities for youth to remain and lead fulfilling lives based on forest and family farming. The seminar, which was hosted by the Forest and Farm Facility and the International Family Forestry Alliance, was held to recognize the vital role of family, community, and indigenous people forests and farms in the celebration of the International Year of Family Farming.